Practically all presently manufactured 802.11g wireless adapters have such suffixes as "super G", "turbo", "plus", etc. But suffixes are only half the work. Manufacturers (to be more exact, their marketing specialists) decorate their boxes with the 108 Mbit/s or even 125 Mbit/s labels. But look before you leap, as the proverb runs. In our case it means that it would do no hurt to find out more details about these mysterious techniques, how they work, and what data rates they really provide (and the most important thing - under what conditions). In other words, we should make allowance for the most important thing to marketing guys - to sell solutions from their company. There are many ways "to overclock" the standard 802.11g. To be more exact, every chip manufacturer has its own way (at least - they are called differently). Unfortunately, not all manufacturers explain the details of their techniques. I managed to find information on these techniques only for Atheros and Texas Instruments. But the most informative resource is provided by Atheros - it even has a separate web site, devoted to their Super G and Super AG techniques. In fact, most part of this article is a compilation of the information from the web sites of Atheros and Texas Instruments and only minute details from other sources. Let's proceed to the techniques. At first let's have a look at the "pure" 802.11g. Maximum throughput of this mode is 54 Mbit/s. I guess the majority of users know how to convert megabits into megabytes? That's right, you should divide megabits by eight to get the data rate - 6.75 MB/s. But attentive readers (those who don't just look through introductions and conclusions, but actually browse diagrams with performance readings) know that the regular 802.11g mode does not provide more than ~25 Mbit. Hey, that's only half of the 54 Mbit! Where is the other half? "Where" is a topic in its own right. I can only note that, indeed, user data makes for only half (at best) of the channel bandwidth. That's the first bad news. There is also the second bad news. Radio waves (it's actually them who transmit data in wireless networks) are transmitted in all directions from the signal source (it's a general case). That is everyone hears the transmitter. Everyone can choose to receive data or not, that's not important. What's important - these people cannot transmit anything on the same frequency at that moment. To be more exact, they can try, but signals from both sources will overlap, which will lead to the distortion and loss of the data. In other words, only one of several sources operating at the same frequency can transmit data at a time in wireless networks. That is the walkie-talkie principle - first you talk, then you keep silence and listen. Thus, the generously allocated ~25 Mbit are divided between all participants of a wireless network. If the number of clients is 5 hosts and all of them are actively transmitting data, every participant will have the bandwidth of about 5 Mbit (in fact, it will be even a tad lower). There is also the third bad news. The second bad news about 5 Mbit per each of 5 hosts is true only in case of Ad Hoc network, that is without an access point. If we take a more general case with an access point, those miserable 5 Mbit will have to be divided into two. Any exchange with clients in the Infrastructure mode (with an access point) goes via an access point. At first it should receive data and then retranslate it to the recipient. As a result, we get 2 and a little more megabit per user. Divide these figures by two (we'll touch upon the ideal case later). That means 60 Mbit maximum in case of one client and consequently n-times smaller in case of N clients. If all you want is to find out whether it's time to get rid of wires or "wait a little", you may skip the rest of the article. The answer is it's too early so far. At least wait for WiMAX. Now let's proceed to a more thorough examination of techniques for increasing wireless throughput compared to the standard 802.11g mode. I guess all advantages (turbo, etc) of the manufacturers are just the same thing as in TI and Atheros, but under different names. But implementation details may be different, so techniques from different manufacturers may be incompatible with each other. 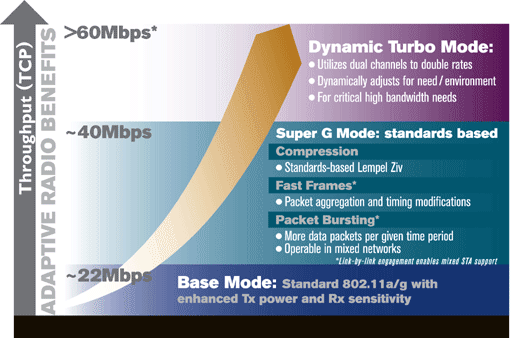 Atheros technique for 802.11g is called Super G (there is another one - Super AG; it's the same thing, but for 802.11a, i.e. for 5 GHz networks). Atheros Super G allows to increase the throughput to 108 Mbit/s. As Atheros honestly declares, user's data rate may reach 60 Mbit. The base 802.11g or 802.11a mode, where all extended techniques are disabled, allows up to 22 Mbit (net value, that is available to a user). Adding techniques, which will probably be included into the future 802.11e standard (Bursting, Fast Frames, Compression), we can increase the performance up to 40 Mbit inclusive. Activating Dynamic Turbo mode, that is utilizing dual channels for data transfers, may increase performance to the theoretical maximum of 60 Mbit. The above figures are certainly the maximum possible performance in a given mode (in the ideal case). In reality everything will depend on such conditions as client's distance from an access point, a number of clients operating simultaneously, radio environment around the wireless network, etc. Wireless performance boosts from Texas Instruments are called G-Plus. Some of them resemble techniques from Atheros, the others are characteristic of TI alone. Let's dwell on each of the above mentioned techniques - bursting, compression, fast frames, dynamic turbo. Interestingly, all the four techniques work independently, thus maximizing performance simultaneously in several ways. Frame Bursting is a transmission technique supported by the draft 802.11e QoS specification. Frame Bursting increases the throughput of any (point-to-point) 802.11a, b or g link by reducing the overhead associated with the wireless transmission. This results in the ability to support higher data throughput in both homogeneous and mixed networks. Picture 2 shows an example of a standard transmission (without bursting). In standard mode we can see the process of transmitting two frames (frame1 and frame2) from Source to Destination in time. The process of data transmission is divided into time intervals (axis X is time). As only one source can transmit data at a time, each station should contend for airtime during DIFS (Distributed InterFrame Space). If no other station is transmitting, the airtime is free and a frame can be transmitted. After a frame is transmitted (frame1), the transmitter waits for a confirmation on a successful delivery from the destination. The destination must send an acknowledgement (ack) practically immediately after SIFS - Short InterFrame Space (if there was no acknowledgement, the source considers that the frame was not received and must resend it). After receiving an acknowledgement, the sender must again wait for DIFS and only then (if the air is still free) start sending Frame 2. And so on. Thus, DIFS take up a considerable part of wireless throughput. In this mode (Picture 3), the source and the destination capture a channel in turns for their transmissions. After frame1 is transmitted and the acknowledgement is received, the transmitter does not wait the required DIFS. The sender waits only SIFS and then transmits the second data frame, etc. Thus, the sender does not give an opportunity for other stations to start transmissions - they have to wait for the end of this burst transmission. Of course, the total transmission time in this mode is limited (otherwise, transmission of several gigabytes would have paralyzed other clients of a given wireless network completely). But eliminating DIFS allows a larger chunk of data transmitted over the same period of time, thus saving the channel throughput, that is increasing the total transmission performance. Atheros announces that all its products support this technique. But devices from other manufacturers, which do not support this technique, may fail to understand this burst mode. So, if communicating with a product that fails to acknowledge a burst transmission, the source falls back to the base mode. TI also eliminates the "long" interframe space, by reducing overheads on transmission. Both companies do not provide information on compatibility of burst techniques from TI and Atheros. Similar "bursting" techniques are probably offered by other manufacturers as well. But Atheros went further than that and expanded this technique to "dynamic bursting". It announces that this technique is especially effective in networks with the number of wireless clients exceeding one. For example, if there are two stations, near and far from an access point. Of course, the far station will operate with an access point at a lower data rate (because of the distance). That's why its transmission (to the near client) of a given size will take more time than it will take the near client to receive the data. In this case bursting activation for the far station allows to reduce the airtime and, strange as it may seem, it also allows the nearby station to receive this data still faster (since it will spend less time contending for airtime). Burst transmission periods also depend on the distance (to be more exact, on data rates). The nearby client is granted a longer burst transmission, as it will burst more frames, while consuming much less airtime. The second technique from Atheros that extends the 802.11 standard is hardware compression. It's built into all 802.11a,b,g chipsets from this company. It uses the Lempel Ziv algorithm. The same algorithm is used in such archivers as gzip, pkzip, winzip. This engine compresses prior to transmission and decompresses after reception. Unfortunately, the data is not analyzed before it's compressed, all frames are compressed. Thus, it's not always good - for example, sending an already compressed file may increase the size of wireless transmission. On the other hand, well compressible data will be transmitted in smaller frames, thus consuming less airtime. This airtime can be used by other wireless stations. The size of the resulting frame may reach 3000 bytes, which is twice as large as the maximum frame size of a standard ethernet packet. Thus, Fast Frames technique will work even with wireline transmissions with maximum packet size (1500 bytes), by merging each two ethernet packets into a single larger packet. Once FastFrames have been negotiated between an access point and a station, both the AP and the station can send wireless frames of 3000 bytes to the corresponding peer. Considering that Fast Frames can operate together with Frame Bursting, we get very good data rates. By the way, according to Atheros, most manufacturers, using Frame Bursting in their chips, actually don't support Fast Frames. Atheros is all right - their devices support both techniques. The Fast Frames technique is also based on the 802.11e draft standard. Nevertheless, it may not be supported by all third party hardware. On the other hand, this technique functions within existing timing parameters (unlike Frame Bursting, which exclusively captures a channel for some time). That's the reason Fast Frames are better for wireless networks that use equipment from various manufacturers. The Frame Concatenation technique in devices from Texas Instruments uses the same principles as Fast Frames from Atheros. Thus, it gains by eliminating overheads and interframe spaces from one or more frames. TI claims that its Frame Concatenation technique will work with any 802.11b/b+/g devices from TI and (! )other manufacturers. It's not quite clear what this company meant by other manufacturers, if the latter don't support this technique... Perhaps it meant operations with frames that don't exceed the standard size (1500 bytes). Frame Concatenation incorporates an algorithm that allows to merge only selected packets into mega-frames. For example, if there is only one frame in queue to be sent to a given destination, it will be sent immediately. In other words, only frames to the same destination address (MAC address of a receiver, in this case) will be merged. The algorithm works only with unicast packets - multicast packets as well as control packets are sent without changes. At present, the maximum size of a Concatenation packet may reach 4096 bytes (which is an indirect sign that this technique is not compatible with its Atheros counterpart). As we can see, manufacturers are not waiting for the official announcement of the standards (802.11e in this case), but integrate these new techniques into their products. Thus, they obtain good results as far as performance gains are concerned, on the one hand. But on the other hand, techniques from different manufacturers are often incompatible with each other. We haven't reviewed Dynamic Turbo from Atheros yet. It will be described in the second part of the article. If we find documentation about such techniques as super/plus/etc from other manufacturers of wireless solutions (or if you post links to such documents in our forum (the link to our forum is right after this article, a tad below)), reviews of these techniques will also be added to the second part of the article.